Many virulence-associated genes of pathogenic E. coli are frequently located on (formerly) mobile genetic elements such as bacteriophages, plasmids, and geno-mic islands. A variety of pathogenic E. coli isolates have been analyzed with respect to the presence and spread of virulence-associated genes. 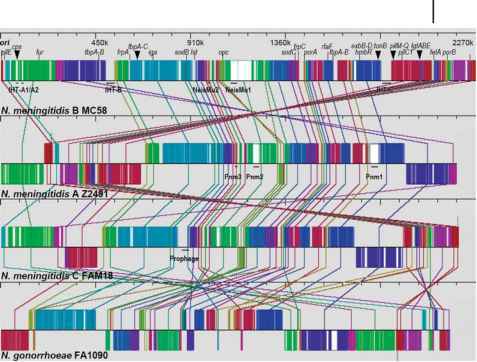 The presence of distinct genomic islands (GEIs) encoding virulence determinants, designated pathogenicity islands (PAIs), has been shown for a broad variety of bacteria including various strains of the different E. coli pathotypes [10, 11, 47]. Studies on their prevalence and phylogenetic relation in, e.g., ExPEC have been undertaken recently [48-52]. As a result, ExPEC virulence factors exhibit distinct patterns of phylogenetic distribution. This provides evidence of both vertical and horizontal transmission of the corresponding virulence-associated genes as well as of host-specific associations and strong associations among different virulence-associated genes. The GEIs that have been identified so far carry a variety of virulence factors that represent the entire spectrum of bacterial virulence-associated genes, including adhesins, toxins, iron uptake systems, secretion systems, and strategies to avoid the host defense mechanisms. E. coli PAIs that have been analyzed in detail are listed in Table 5.3. GEIs represent characteristic features of E. coli and Shigella and seem to play a important role for evolution of different variants or pathotypes. A considerable fraction of the entire genome represents PAIs with significant structural and functional diversity. There are hardly any pathogenic enterobacterial species with only one PAI per strain, and the number of multiple PAIs detected in individual isolates is constantly increasing [43, 53-56]. This is corroborated by the complete genome sequences: in pathogenic E. coli strains, up to 13 PAI-like genetic entities have been identified in one strain [32-34]. Eight chromosomal regions in S.flexneri 2a exhibit some features of PAIs [14, 15]. The growing sequence information about PAIs of different gram-negative species demonstrates that horizontal gene transfer and homologous recombination play a pivotal role in the evolution of PAIs and enterobacteria. Comparison of PAIs of E. coli reveals that identical or almost identical PAIs can be detected in different enterobacterial species, pathotypes, or strains. Typical examples are the so-called "high pathogenicity island" (HPI), initially described in pathogenic yersiniae, and the "locus of enterocyte effacement' (LEE). However, many PAIs have a mosaic-like, modular structure, and although many of them superficially resemble each other with respect to the presence and/or genetic linkage of certain virulence determinants, great variability exists with regard to PAI composition, structural organization, and chromosomal localization even among strains of the same patho- or serotype [43, 51, 55, 57]. Recently, even the LEE island in E. coli, which is generally considered to be a clonal unit inside a clonal host and thus expected to evolve as a single unit, has been shown to exhibit a mosaic-like composition [58-60]. Many PAI regions exhibit notable homology to fragments of mobile genetic elements such as bacteriophages and enterobacterial virulence plasmids. Furthermore, multiple copies of accessory DNA elements or fragments thereof that are present on islands in one genome facilitate homologous recombination within one or between different islands or horizontally acquired DNA elements, thus leading to rearrangements, deletions, and acquisition of "foreign" DNA. iro, salmochelin determinant; HPI, high pathogenicity island; wb*O6, O6 LPS side chain biosynthesis determinant; sat, secreted autotransporter toxin determinant; iuc, aero-bactin determinant; iha, IrgA homologue (Iha) adhesin determinant; kps, capsule determinant; chu, E. coli hemin uptake determinant; cva, colicin V export-related gene; wa*, LPS core biosynthesis determinant; pap, P fimbrial determinant; prf, P-related fimbriae determinant; pix, pilus involved in E. coli X2194 adhesion determinant; hly, a-hemolysin determinant; PAI, pathogenicity island. 3 Fig. 5.2 Comparison of the genetic organization of GEI IINissle 1917 and the pheV-associated PAI of E. coli strain CFT073 (A) demonstrating the loss of the a-hemolysin-encoding determinant (hly) and of large parts of the P fimbrial operon (pap) in strain Nissle 1917. The DNA sequences comparison ofthe two islands is visualized using Artemis and ACT . recombination events. These events were important for the evolution of an ancestor of strain Nissle 1917 as they were responsible for inactivation of the P-fimbrial operon (and probably for the loss of the a-hemolysin-encoding determinant as well), reducing the hypothetical virulence capacity of the corresponding strain. 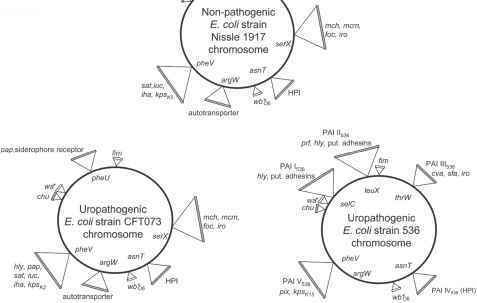 According to the available data on genome content and organization of the E. coli O6 strains Nissle 1917, CFT073, and 536, it is tempting to speculate on the evolution of the nonpathogenic, probiotic character of the first strain and of uropatho-genicity of the latter two isolates. Strain Nissle 1917 is characterized by a specific combination of traits which enable successful survival and colonization of the human intestine. In addition, this strain does not express important virulence factors of uropathogenic E. coli due to gene loss by deletion and point mutations [61, 62]. Meanwhile, raw genome data of nonpathogenic probiotic E. coli strain Nissle 1917 support these results and confirm that this strain's 5.1-Mbp genome is more similar to that of UPEC strain CFT073 than to the other completely sequenced E. coli strains . An interesting aspect of PAI evolution may also be duplication of entire islands. The genome of the EHEC O157:H7 strain EDL933 contains two PAI-like structures (the so-called O-islands #43 and #48) inserted next to the serW and serX tRNA-encoding genes, which comprise 106 genes and include those for tellurite resistance and urease production . The sepsis strain AL862 carries two 61-kbp PAIs which are located at pheVand pheU and which contain the afimbrial adhesin variant 8 (afa8) gene cluster. Whether they are real duplicates will have to be confirmed by sequence determination of both islands .